A new swathe of reclaimed land from the Atlantic Ocean and close to Victoria Island in Lagos, Nigeria, will be home to a series of new hotels that will form part of the Eko Atlantic development. 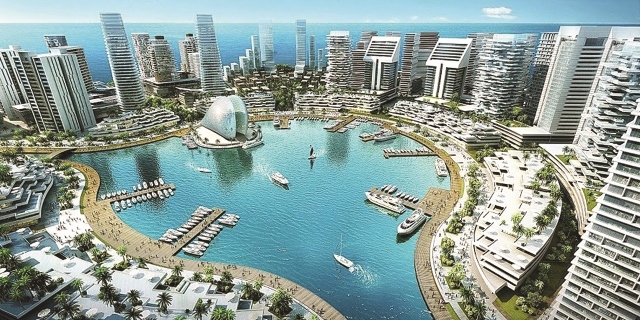 Billed as the “new economic capital of Africa”, Eko Atlantic will contribute 10 million square meters of new residential, commercial, retail and recreational space to the Nigerian capital. The new-build city will rival similar cities such as Dubai and Abu-Dhabi, and will be one of the most vibrant and desirable locations in East Africa. Structurally sound and sustainably engineered, a bounding wall, known as the Great Wall of Lagos, will separate the new city from the sea beyond, and a 24/7 power supply will facilitate all of the residents’ needs around the clock. As part of the new development, accommodation for over 400,000 residents will be provided as part of the residential side of the project. Offering additional housing for dwellers in Nigeria’s capital city, which is currently suffering from a housing shortage, a mix of short and long term apartments, houses and condos will be available across a broad pricing spectrum, making potential residents a priority for the new island. The Marina District will not only provide business opportunities and commercial spaces, but also residences and hotels. A number of new hotels are planned within the scheme, including a 500-key new-build 4 star hotel and resort that will feature a wellness centre and business and conference facilities. Residences and hotels will be situated on the Azuri Peninsula overlooking the marina and benefiting from idyllic views across the waterfront and cultivating a world of “effortlessly luxurious living”. The first of these hotels and residences are set to open this year. Eko Atlantic is a dynamic new city that will rise from the Atlantic Ocean, adjacent to Victoria Island in Lagos, Nigeria the biggest and fastest growing city in West Africa. It will be built on land that is being reclaimed from the sea, and is now for sale.Eko Atlantic will become home to at least 250,000 residents, with commuter volume expected to exceed 150,000 people daily.